Edematous plaques: wheals or hives (see Photos 20-22). These raised plaques have sharp margins and the central color can vary from pink to yellow to white. A peau d'orange effect may be present in the center and there is often a peripheral dusky blotchy red border, which is the axon reflex. Individual hives may vary from a few millimeters to greater than palm-sized. Hives may remain discrete or may become confluent, forming geometric and polycyclic shapes. Pruritus is usually severe, especially at onset, and the lesions usually evolve rapidly, then resolve within a few hours. 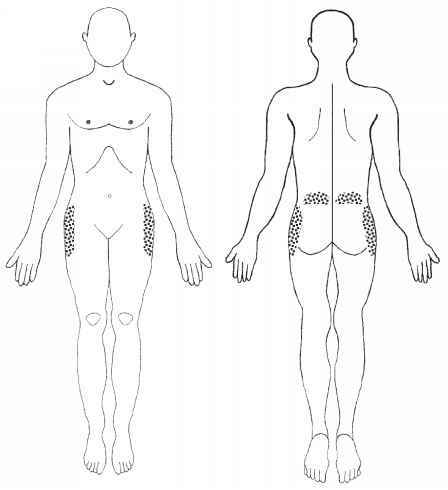 Although they are usually primary lesions, rarely bullae may develop as secondary lesions on the hive surface when edema is rapid and severe. Also very rarely purpura may occur in hives with marked vasodilation. Macrodistribution: May occur at any site. 2. Polycyclic (see Photo 22). These configurations have no diagnostic or etiologic significance.